A new online calculator was launched yesterday to help people work out how much they will have to pay when disability insurance scheme CareShield Life is launched in 2020. The Ministry of Health (MOH) said the gadget will provide Singapore residents with information about their estimated premiums before and after applicable subsidies and incentives. Users will need to answer questions about their date of birth, gender, current ElderShield coverage as well as their income, housing type and citizenship status. CareShield Life will replace ElderShield for younger residents, and it will be compulsory for people aged 30 to 40 to pay premiums from 2020. Future cohorts will join CareShield Life at the age of 30, while those born in 1979 or earlier can choose to join CareShield Life in 2021 if they are not severely disabled. Singaporeans who are currently insured on ElderShield - which is optional and provides payouts for a limited amount of time - can choose to upgrade to Care-Shield Life. 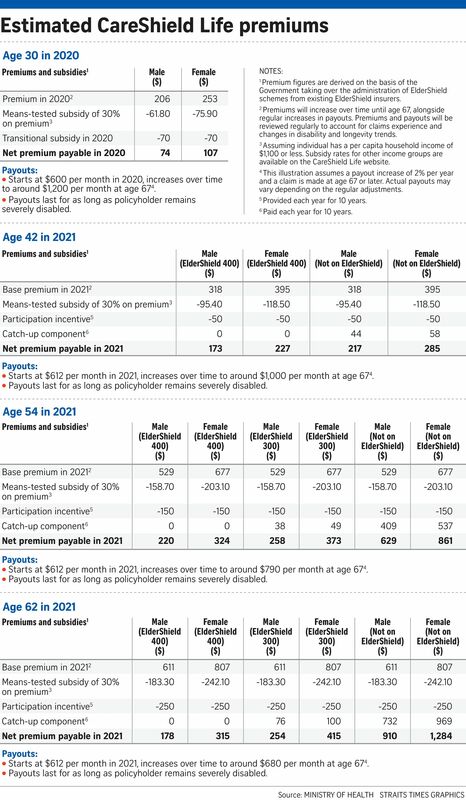 The premiums they have paid for ElderShield will be taken into account when calculating their CareShield Life premiums. The calculator can be used by Singaporeans and permanent residents born between 1946 and 1990. Singapore residents born in 1991 or later will be provided with their premium figures when they are enrolled in the CareShield Life scheme at age 30. No Singaporean who joins CareShield Life will lose coverage due to an inability to pay their premiums. Those born before 1946 can call the Healthcare Hotline on 1800-222-3399 for more details about their estimated premiums, subsidies and incentives. This group will have to pay higher annual CareShield Life premiums as they have fewer years over which to spread the payments, MOH said. Meanwhile, those on other ElderShield policy arrangements will be able to find out more about their estimated premiums closer to 2021, when they are able to join the scheme. This group includes people who opted out of ElderShield at age 40 but subsequently rejoined the scheme, those born between 1956 and 1967 who opted for a single-premium payment term for ElderShield, and those who have a paid-up policy. CareShield Life premiums can be paid using Medisave, and subsidies and incentives will be provided. Lower-to middle-income Singapore residents will receive means-tested subsidies. Up to two-thirds of Singapore resident households will be eligible for CareShield Life subsidies of up to 30 per cent. Singaporeans in future cohorts (born in 1980 or later) will receive transitional subsidies of up to $250, spread over the first five years from 2020 to 2024. Singaporeans in existing cohorts (born in 1979 or earlier) will receive participation incentives of up to $2,500, spread over the first 10 years of their policy, if they join CareShield Life in the first two years from 2021. Singaporeans who are unable to pay for their premiums after subsidies can apply for addi-tional premium support from the Government. MOH said: "No Singaporean who joins CareShield Life will lose coverage due to an inability to pay their premiums."